It’s been a busy week! On Saturday I chaired the Naval Dockyards Society AGM at the National Maritime Museum, Greenwich, before joining a party of society members on a walking tour of the site of the old Deptford royal dockyard. This is currently the location of a huge and ongoing archaeological dig preparatory to redevelopment of the site, although the development itself is proving controversial and is about to be redesigned yet again. The tour was certainly a real eye-opener. 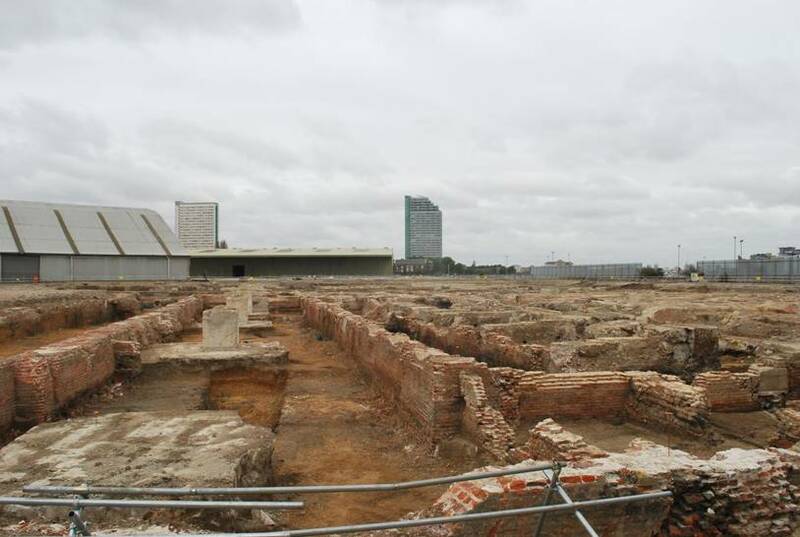 Although the vast foundations of the Tudor ‘great storehouse’ (left) have now been covered over, work has moved on to other parts of the site, exposing, for example, the dockyard smithy, No. 1 slipway and, most interesting of all from the viewpoint of a Stuart navy buff like myself, the walls of the wet dock, including a fragment of timber from the 16th century wall (below right). This struck a particular chord with me as the wet dock is the setting for an important scene in ‘Quinton 2’, The Mountain of Gold, which seems to be going down really well in the US following its publication there a few weeks ago. To think that this would have been part of the dockyard that Samuel Pepys knew, and where, in my fiction, Matthew Quinton fought the flames threatening the Seraph! It was also reassuring to find that my description of the dimensions of the dockyard, e.g. how long it would have taken people to move from one side of it to the other, which I derived from plans and pictures of the yard, was borne out pretty much completely by the actual experience of walking the site. 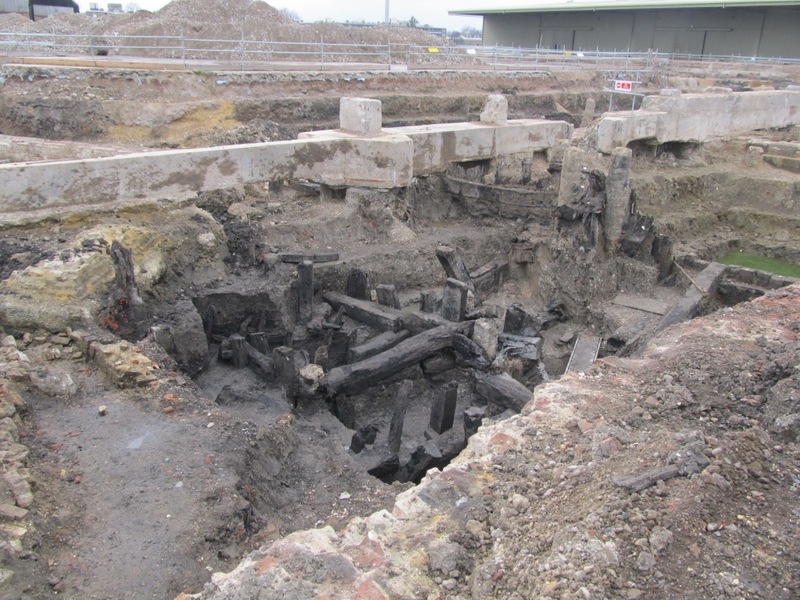 More photos of Deptford dockyard will be posted on the NDS Facebook page in the next few days. I was also in Greenwich a couple of days earlier to welcome back to England the sternpiece of the Royal Charles, captured by the Dutch at Chatham in 1667, which is returning to form part of the forthcoming Royal River exhibition at the NMM (I’ve been invited to the royal opening of this by the Queen and the Duke of Edinburgh, so hopefully will be able to provide a ‘sneak preview’ in a future post). I’ve covered the sternpiece, and provided a picture of it, in an earlier post, so I won’t dwell on the importance of this iconic item here. But the return itself wasn’t quite what I’d expected. We were due to go aboard HNlMS Holland, the newest ship in the Dutch Navy, at moorings off Greenwich, but arrived to find said moorings disconcertingly empty. It transpired that thick fog had prevented her coming up the Thames on time, so the whole event had been moved to the Queen’s House. At this point I still expected the event in question to consist of a few dozen museum and embassy people milling around. 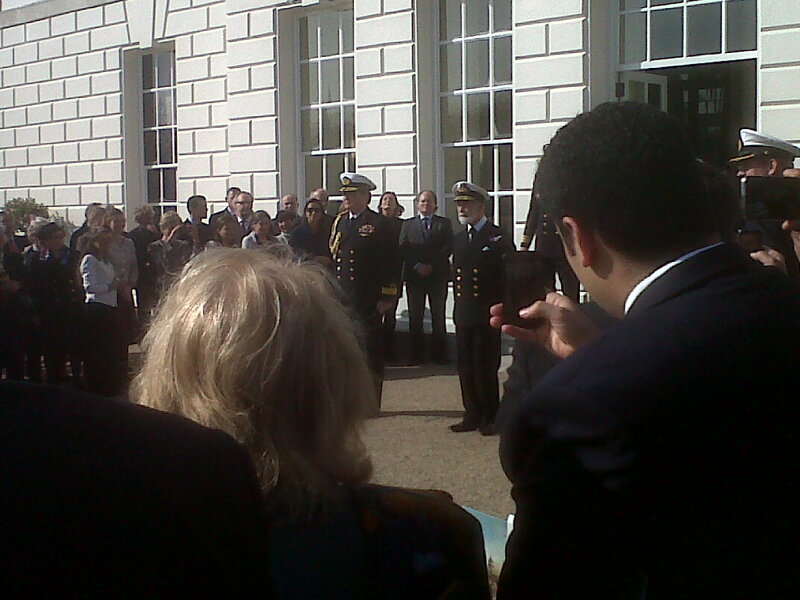 Instead, the lawn behind Queen’s House was filled with hundreds of people, large numbers of military and naval folk in dress uniform, a naval guard of honour, along with TV and press galore. We had an announcement that ‘the princes are coming’, and a few minutes later, they duly appeared – Prince Michael of Kent and the Prince of Orange, heir to the Dutch throne, both in flag officer uniforms. 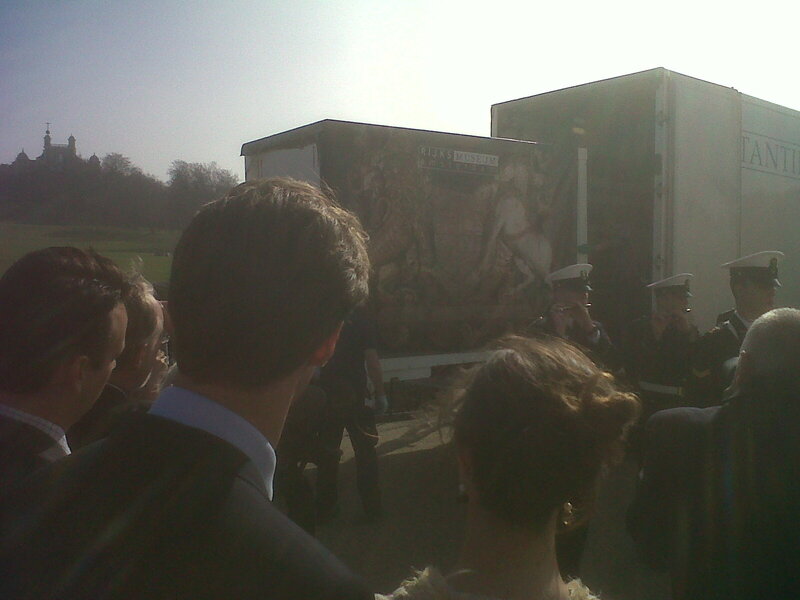 The band played, the dignitaries saluted and up rolled…a typical British furniture van, from which emerged typical British removal men, who proceeded to unload a very large box adorned with a picture of the sternpiece; and as is the way of British removal men, they did so with much grunting, scratching of heads and seemingly coming very close to dropping the whole thing off the back of the van. Nevertheless, the box duly emerged, the speeches were made (I’ll draw a veil over the number of basic historical howlers in one of them in particular) and the audience turned to the champagne, canapes and networking, which in my case involved talking about the volume of views of battles of the third Anglo-Dutch war that I’m editing for the Navy Records Society. From a purely personal viewpoint, the return of the Royal Charles sternpiece is remarkably timely. She was the fleet flagship in the 1665 campaign and above all in the Battle of Lowestoft on 3 June, which forms the climax of ‘Quinton 3’, The Blast That Tears The Skies. Indeed, her duel with the Dutch flagship Eendracht leads to the dramatic event that gives the book its title. (Incidentally, several people have asked me about the origin of the title; it’s from the third verse of Rule, Britannia.) Several important scenes are set aboard the Royal Charles and quite a number of them are based on real events, such as a council of war that was attended by some of the most famous names of Restoration England and the Restoration Navy: King Charles II’s brother James, Duke of York, Lord High Admiral and the future King James II & VII; Charles’s illegitimate son the Duke of Monmouth; Prince Rupert of the Rhine; the Duke of Buckingham, one of the most famous Restoration rakes; Sir William Penn, father of the founder of Pennsylvania; and of course, in my version by Matthew Quinton too. They would have been sitting literally a few feet from the wonderful relic of the Restoration navy that will be on display at Greenwich this summer and which I strongly urge all of you in the UK to go and see – clutching copies of Blast of course! I see you stumbled onto The Eagle Clawed Wolfe recently. I hope you found something of interest. I was delighted to find your site. My MA dissertation was a comparison of the Royal Dockyards and the Venetian arsenal in the seventeenth century and the Stuart navy, Peyps aside, seems much neglected. I intend to write couple of pieces on Phineas Pett in the near future, which might be interesting to you. In the mean time, I must try your fiction. Good to hear from you! Your thesis sounds interesting – the Naval Dockyards Society, which I chair, held a conference about the Venetian arsenal a few years ago, and the papers were published as a volume of our Transactions. I’m enjoying your blog; I’ve always had a great interest in 1688, and will certainly look forward to pieces about Phineas Pett.